Domaine Des Jeanne had the pleasure of hosting the Drinks Reception from 6pm, led by our Business Development Manager, Denise Douet. Our sincere thanks to our dream team: Denise’s sister, Niamh Nolan, and the Whizz Marketing Ltd duo: Jennifer Nolan and Colma Lineen (Instagram: @whizzireland – www.whizz.ie) who were all a priceless addition on the night. 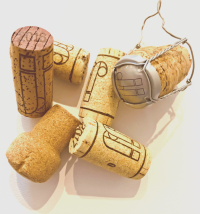 Together, they helped us spread the word about our delicious collection of wine from the Luberon in the South of France. We arrived early to set up our display and decorated it with flowers, candles, and our superb sparkling wines: JJ Bulle Blanche. The air was filled with a buzz of excitement between all the vendors as everyone prepared for the guests to arrive. At 6pm the event kicked off and Lisa personally greeted over 300 glamorous ladies at the entrance. 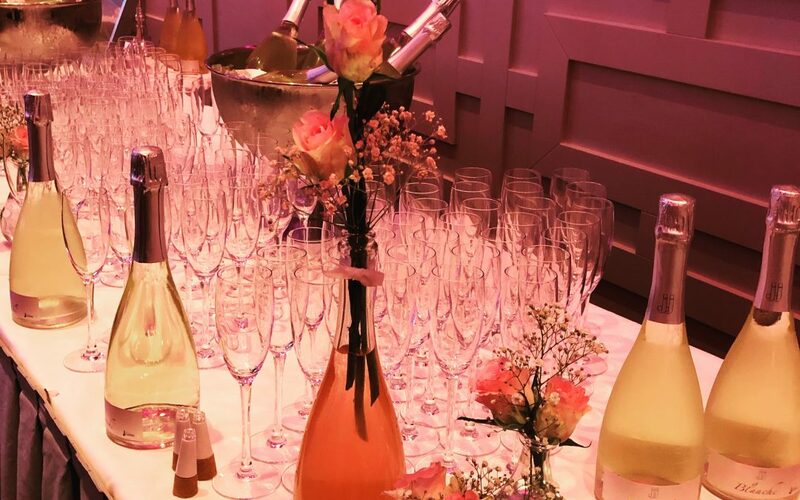 All the guests enjoyed a complimentary glass of our JJ Bulle Blanche, followed by shopping and beauty demonstrations from some of Ireland’s leading names. The guests were all seated where they enjoyed dinner, a full fashion show, and top beauty tips and demonstrations from some of Ireland’s premium brands and boutiques. Next to our table, was Laura, the owner of The Juice Works (Instagram: @thejuiceworksireland – thejuiceworks.ie) with her tasty range of cold-pressed juices and cleanses (no additives, no chemicals) which can be delivered straight to your door. She is one of only a handful of fully qualified independent Juicing Therapists in Ireland. All her juices are vegetable based, raw & cold-pressed, unpasteurised, non-diluted and… delicious! Even if we do say so ourselves. Oonagh O’Hagan, Managing Director from Meaghers Pharmacy (@meagherspharmacy – meagherspharmacy) was there with her extensive range of products. With 8 locations around Dublin, Meagher’s Pharmacy Group is a leader in the Dublin area. It was recently recognised as a Deloitte best managed company and continues to be recognised as a leader in both customer service and a supplier of leading product ranges. Jerome from Human+Kind, a Cork based business (Instagram: @humanandkind – humanandkind.com) was there with his beautiful range of Face, Body, and Hair care products that are for both cleansing and moisturisation. All products are Vegan, Cruelty-Free, Natural, Ethically-Sources and Paraben Free. Some of their most popular products include their Family Remedy Cream, Wash-Off Facial Cleanser, Day+Night Cream, Hand + Elbow + Foot Cream, Body Soufflé, Body Oil, In-Shower Body Moisturiser, and Sensitive Shampoo+Body Wash and Conditioner… Our favourite was the Grapefruit… you could eat it! Next up, was the fabulous Bernadine from Spicey B (Instagram: @spiceyb2 – spiceyb.com). We made quite a few trips to her stand as we wanted all her jewellery… Her necklaces and earrings are to die for!! Visit her website to browse her online store where you can buy stunning Statement Earrings, Mini Statement Earrings, Stud Earrings, Statement Necklaces, Delicate Necklaces, Layered Necklaces, Fedora’s, Beach/Holiday Bags, Scarves, Neon LED Lights and lots more lovely things! She provides offer free shipping on all products within Ireland & on International shipments if you spend over €50!!! The owners of Absolutely Fabulous Hampers (Instagram: @absolutelyfabuloushampers1 – absolutelyfabuloushampers.ie), the delightful Val & Sue. We had the pleasure of having dinner with these lovely ladies and they brightened our night with their sense of humour and fun. They supply hampers for all occasions and pride themselves on their imagination, style, quality and affordability. Check out their website and keep them in mind for when you’re looking for a unique present for a wedding, baby, special celebrations, corporate gifts, and lots more. We were also joined for dinner by the ultra glam, Make-Up Artist, Gráinne McCoy (Instagram: @grainnemccoy_ – http://grainnemccoy.com) who also hosted a stand showcasing her fabulous lash collection and was up on stage giving a lash demonstration. Gráinne has an exciting year ahead as she is the mastermind the MUBAs (Make-Up & Beauty awards – Instagram: @makeupandbeautyawardsni – http://makeupandbeautyawards.com). The MUBAs are Northern Ireland’s Makeup & Beauty Awards and will be held on Sunday 7th April at the fabulous Titanic Building, Belfast. This brand new, decadent black-tie awards evening honours the exemplary work within the Makeup & Beauty Industry, across sectors including Makeup Artistry, Beauty Salons, Beauticians, Online Influencers, Nail Technicians and much more. Baumann Jewellers (Instagram: @baumann_jewels – baumannjewellers.com) from Dungarvan, Co. Waterford with their amazing range of ChloBo, Cluse, Ted Baker jewellery and lots more. Jennifer’s Hat Emporium (Instagram: @jennifershatemporium – jennifershatemporium) in Kildare was there showcasing her Hat Hire business. She offers nationwide delivery and a collection service. The Mother & Daughter team, I-SPY clothing (Instagram: @theispyteam – i-spy.ie) were on hand with their 100% non see-through fitness and yoga wear, with wordwide shipping. The multiple award-winning fragrance brand, Brooke & Shoals Fragrances (Instagram: @brookeandshoalsfragrances – brookeandshoals.com) showcased their Brooke& Shoals scented candles – natural, luxurious and hand-made in Ireland. Their sophisticated harmonious fragrances create divine aroma’s that last. We also met Award-Winning, Irish Fashion Designer, Marion Murphy Cooney (Instagram: @marion_murphy_cooney – www.marionmurphycooney.com) who has the most incredible collection of ready to wear and an atelier service available in Nenagh, Co. Tipperary. Her new collection is about ‘dressing up’, but in a comfortable, confident way. The MMC collection fabrics are satins, brocades, crepes and others that bring an instant touch of luxury. Marion has put huge work into developing good sizing and an excellent ‘fit’ and gone to one of Italy’s leading makers to have her collection finished to the highest standards. It is made in the same factory as labels like Ellie Saab and Etro. Visit her website to check out her Spring / Summer Collection 2019. Behind the scenes of a show like this, Lisa & Linda work day and night to make sure the show goes off without a hitch. It takes months and months of preparation and tons of hard work. In fact, the planning for the next show begins as soon as the last one ends… Thank you so much to Lisa McGowan (@lisas_lust_list), Linda Blanchfield and the rest of the team, we were honoured to be part of such an amazing night. Huge congratulations on such a successful show! To order our delicious wine, please visit our website: www.domainedesjeanne.com or contact Denise Douet via email: denise@domainedesjeanne.com.